The hardware also included a number of proprietary ASICs which were designed to speed up the machine even further, in particular in I/O. It had a brand new SCSI controller and used a specific ultrafast type of 64 pin SIMM RAM with parity. Since the hardware was higly customized, to exploit it properly the Mac IIfx needed a specific and highly optimized version of the System, the Macintosh’s OS. In alternative one could use A/UX, Apple’s version of AT&T UNIX, which was concurrently made available in a brand new version 2.0. It was released on floppy disks, CD, tape and even in a preinstalled version on the Mac IIfx’s Hard Disk. With A/UX 2.0 the total price of the Mac IIfx could surpass 13000 USD. So, apart from power users, professionals in computer graphics and a few wealthy enthusiasts, who was this model really meant for? Apparently the IIfx was created under a United States government contract, which asked for Unix workstations with specific hardware features and had a generous budget. It’s not clear if and how many units were actually sold to the US administration but at the time Apple was very interested in this high-profile market. It later created a new business division for enterprise systems to serve “large businesses, government, and higher education” and kept on developing A/UX until 1995 and more high-end Macintoshes to run it. 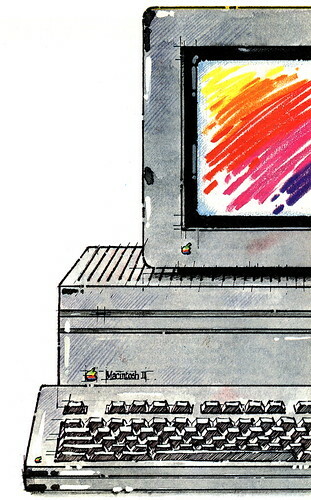 The image of the Mac II case is from an ad featured in italian magazine Applicando in November 1987. I worked at a university when the machine came out and my boss bought one to run SPSS. I was carting it back to the office and people glanced at the box and stared. It wasn’t maxed on memory and had a regular video card, but even so, it definitely was impressive for its time. Started my design career on one of these – 40Hz motherboard, 128Mb of RAM, and a 160Mb hard drive.